Is The Walking Dead Going to Kill Rick Next? Sunday’s episode left us with what was arguably the biggest death of the season so far, though it was one we already knew was coming. Saying goodbye to Carl after watching his character literally grow up before our very eyes wasn’t easy, and it’s like a big blow to morale on the show (and probably IRL if you’re a die-hard fan). But Carl’s death may have also teased the possible demise of an even bigger, more central character: Carl’s dad and The Walking Dead‘s main protagonist, Rick Grimes. In the episode, Carl slowly gave in to the infection he contracted as a result of a bite from one of the walkers. But what we didn’t see coming were Carl’s final wishes for his dad. He told Rick about the future he wanted: one with less bloodshed and more peace. Rick was open to it, and it seemed like Carl’s vision might come true based on the vision of Rick as an old man with a cane we saw in the Season 8 premiere. But is that actually a real vision? It may not be. The end of the episode showed Rick leaning against a tree bleeding heavily from a wound. He did not look good, fam. He looked about an inch from death, TBH. Could this be teasing the end of Rick’s life? It’s definitely possible according to Walking Dead cocreator Robert Kirkman. More: Could [SPOILER] Be the Next Character to Get Killed Off The Walking Dead? So is Rick’s death the next one that’s coming? 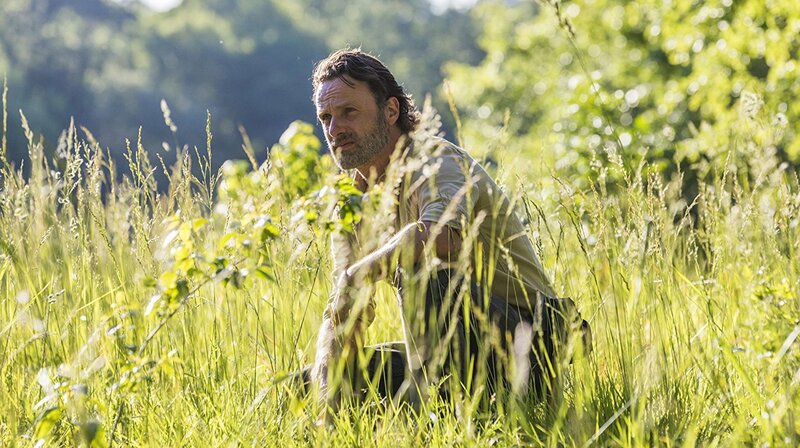 It sounds like only time will tell, so keep an eye out for anything that looks even remotely ominous about Rick’s well-being in upcoming episodes.